Are you looking for a maison of charme? A glass of wine in front of a fireplace?In the charming old town within the walls, at the foot of the castle and near the ancient fountain in Piazza San Rocco, only 200 m from the lakeside (Marina),there is our vacation home. This is a typical residence, located in the center of Bolsena, in a strategic position with regard to various services (supermarket, pizzeria, bakery, bars ...) and with respect to access to the Castle. The house is romantic, cozy and very comfortable, the furnishings and objects are ancient and modern, all chosen with care and in detail. The mansion ensures the comfort of modern houses, reproducing the atmosphere of the house of our grandmothers, in a medieval village. On two levels, newly renovated, 70 sqm, has a living room with fireplace, kitchen, double bedroom, single bedroom, bathroom with shower, terrace for nice dinners by candlelight. There are three bikes for walks along the lake to reach sailing clubs and riding stables and the Natural Park of Turona. Max Capacity: 5 people (one double bedroom, sofa bed, sofa bed).The house is equipped with all the furnishings of plates cups and cutlery from 6 to 12, bedding, bath, kitchen. We thoroughly enjoyed our 1 week stay at Bolsena in this charming house, we stayed May 2015. We were met by Massimo who explained everything and he also kindly took us for a short tour to point out the restaurants and bars, parking etc. We found the house to be very well equipped, clean and comfortable, it felt very homely and we enjoyed eating some of our meals and reading books, relaxing outside on the terrace. Our son travelled from Rome to stay one weekend and we picked him up from Orvieto train station, just 15 minutes away from the house by car. The train journey to Rome is 1 hour, so perfect if you wanted to spend a day in the capital. We enjoyed being in Bolsena, never having been here before, I have to admit we were surprised at how beautiful it is and the surrounding countryside and hill towns are also stunning. We spent one morning walking part of the Francigene Way and heard cuckoos calling in the woods. Magic. The neighbours always thoughtfully asked if everything was OK if we bumped into them outside the house. We ate like kings that week: our menu ranged from delicious porchetta panninis purchased for lunch from just across the road, fresh water fish from the lake at lakeside restaurant, Sunday lunch was at the osteria/bookshop behind the house, the Tanaquilla restaurant is well worth a visit, scrummy, and in between times we did our own meals buying local delicacies from the supermarket nearby and the alimentari. The house is perfectly situated in the centre of Bolsena so you can experience Italian life as a local and not have far to walk home at the end of an evening! The apartments were really great - it was clean, looks good, has lot of fancy things in it which makes it feel like in own home. It also has everything you need for your stay. Owner was really kind and explained everything and showed apartments, informed about best places in area and even suggested tours around. Also Bolsena as a place is great for lazy relaxation or as a central point for tours to discover Umbria, Lacio and Tuscany regions. Adele, the owner of the house, was very friendly and took care of all our enquiries! The house itself is located in the heart of Bolsena, so you have you will find everything in walking distance. The house itself is fully equipped, from an orange juice squeezer to bikes you will haved everything you need. We would definitely love to come again! 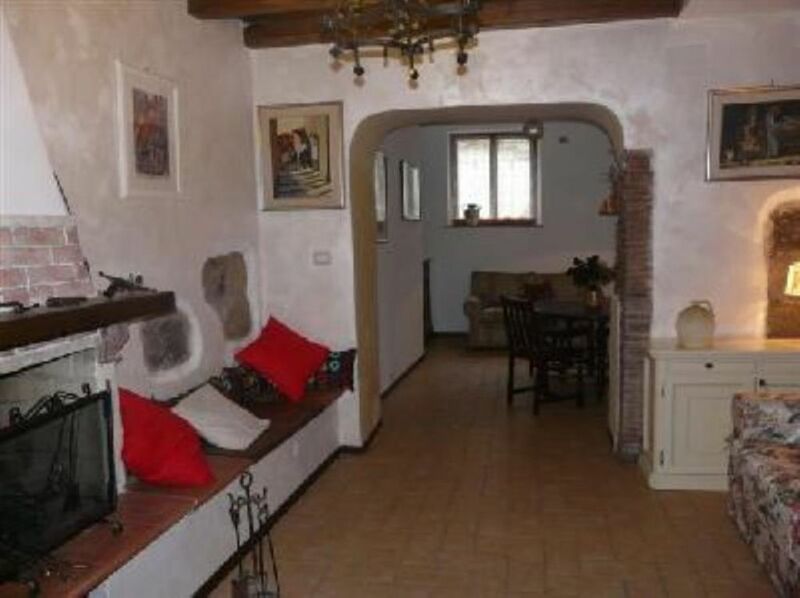 "A very characteristic and charming apartment in the historical center in beautiful Bolsena. The owners, by being extremely helpful and very nice, make you feel at home immediately !" "This is the perfect flat for a couple looking for a romantic holiday or just a break from their busy lifestyle. The owners are very hospital and go out of their way to accommodate and help you. The flat is in close vicinity of shops and restaurants and the lake is only a short distance by bike." In the natural setting of Lake Bolsena, the biggest volcanic lake in Europe, completely surrounded by green mountains Volsini ,the historic village of Bolsena is dominated by the Castle of Prince Cervara Mondaleschi and Santa Cristina's Cathedral.It's placed along the path of medieval pilgrims ,Via Francigena, just 2 km from Turona's natural Park. The house is at the foot of the castle, near Piazza San Rocco, in a picturesque district that is full of alleys and contains historical buildings of noble families, a fountain of 1400, a wash of 1700, the gate of the village called "Florentine" towards Firenze.The mansion has the maximum distance of 50 m all essential services (5 restaurants, ATMs, post office, supermarket, chemist, greengrocer, hairdresser, bakery, tobacco, etc.). There are two theaters hosted by vintage facilities, cinemas, an ice cream shop that won several worldwide awards , an intense activity of concerts, popular events linked to ancient religious traditions , antiques and craft markets and restoration.Many sports can be practised:mountain biking, canoeing, sailing, horseback riding, hiking (especially on the Via Francigena, the medieval pilgrims' route to Rome). Bolsena is strategic to visit Rome (1 h) ,Tuscany and Umbria:Siena(1 h), Florence(2h),Todi(1h).Characteristic villages with evidence of Etruscan, Roman, medieval and 1400 period: Orvieto, Sovana, Pitigliano, Sorano, Civita di Bagnoregio, Viterbo (ancient Baths of the Popes), Saturnia and Monte Amiata (hiking and skiing at 1720m). Here ,"small is beautiful" because it's all on a human scale! !